Firstly, I made a shaped card with Smooth White cardstock using the soon to be released Stitched Tag-Corner Square Stax die set. The face of the card base was stamped with the new Honeycomb Background stamp using MFT Hybrid Natural ink. To give the card a "honey" tone, sorry couldn't resist, the edge of the card was inked with Antique Linen Distress ink. The next layer was cut with the Stitched Hexagon Stax from more Smooth White card with the centre inked using Tumbled Glass Distress ink. Then the bee hive from the new release was stamped on a piece of Copic suitable card with Gravel Gray Hybrid ink and coloured with Copic markers. It was then cut out using the co-ordinating Die-Namics die. As for the sentiment, that was stamped with Versamark ink and heat embossed with Black embossing powder and cut out using a Stitched Sentiment Strip. The miniature bees were created using white shrink plastic. They were stamped with grey ink and coloured with Caran D'Ache Luminance pencils. Once coloured, a quick blast of a heat gun shrunk them down to size, perfect for the beehive image. Then the hexagon was glued to the card base. The beehive and sentiment were adhered with foam squares for added dimension and the tiny bees were finally glued in to place. As a final touch, I added small dots of Nuvo crystal drops in Buttermilk and White. The card is adorable! The colors are lovely, the bees are cute, and the design is great. I love your card, Love the coloring! 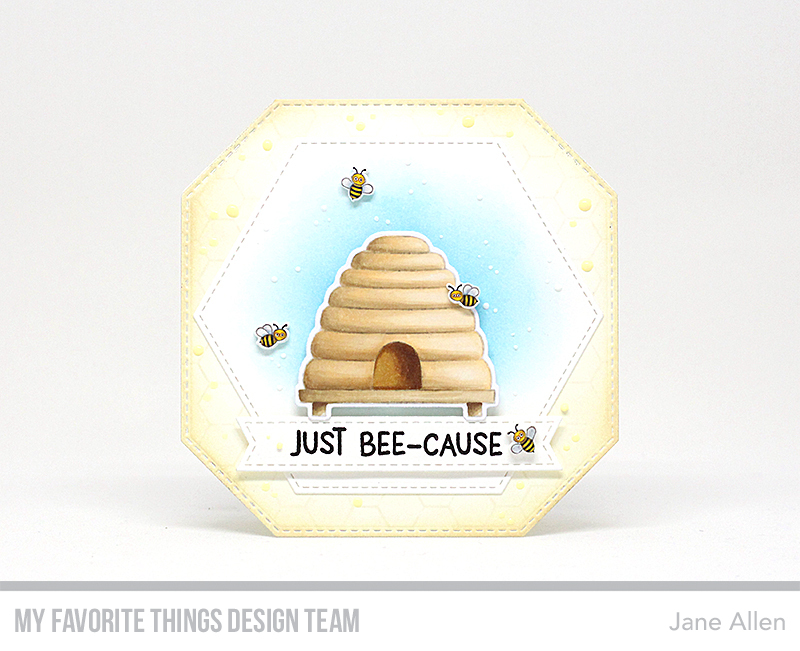 Beautiful coloring and great use of the Hexagon and tag corner shaped dies! This is such a sweet card! I love your card.